We display on this page a recent, very well manufactured fake. Two ideas are to be stressed here. The fakes will still be published on Romanian coins because they hold information about the originals (that are very rare, indeed) or at least their sides and because, being somehow often found on the market, several other collectors might also fall prey to these forgeries. The images of this copy are present on Romanian coins thanks to Mr Balazs Aldor, to whom we are grateful. Mr Balazs Aldor sent us these pictures as didactic material that would prevent unaware collectors of forgery threats. On the previous and next pages you will find a few other fakes manufactured in the same manner as this supposedly denarius from Radu I of Walachia. The sides were independently created through galvanoplasty and then forced together (with more or less craftsmanship), allowing though, usually, a black, separating surface between the two to be noticed. In this case we do not know, but in others the fake was eventually filed on the edge, so that the acquisitor to think the coin underwent the operation hundreds of years ago just for some silver to be stolen. Moreover, the fact that Radu I struck basically silver only is more than conclusive. The expertise for the Romanian medieval coins on Romanian coins was generously made by Mr. Bogdan Costin, specialist in medieval Romanian coinage. 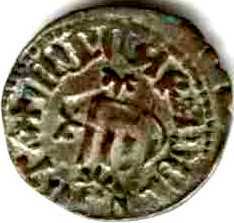 The copy imitates an old medieval Romanian coin issued by Radu I (~1377 - 1383), brother of the famous Vlaicu I (1364 - ~1377) and father of the glorios Mircea the Old. This voivod (reigning prince) achieved for the first time for him and his descendants the title of Great Voivod (appearing on coins also). Yet short reigned, a large variety of silver coins comes from his period. As a type this coin is known to Romanian numismatics as Walachian denarius. In which concerns its pattern (obverse - reverse), it belongs to the most common ducat or denarius type, type that occured to almost every coin issue of the Walachian princes, since Vlaicu I (1364 - 1377) to Basarab (the Old) Laiotă (1473 - 1477, with many interruptions). The legends on the coinage of Radu I were written both in Latin and Cyrillic (Slavic). This one used Latin. All Walachian princes used both official languages for their coinage. The Bible of Romanian numismatics, Monede şi bancnote româneşti by George Buzdugan, Octavian Luchian and Constantin Oprescu (1976), quotes at position 49 a piece that seems resemblant, but does not display a picture. 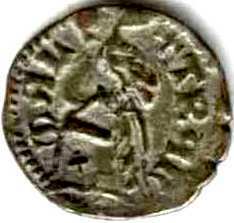 Walachian coins are poorly available on the net with pictures. Romanian coins is almost the only place to have a few ones and to display some decent information. Help from other collectors to change the present status is more than needed. Do not hesitate to contact us.